Don’t you crave that feeling of “the Glide” when you catch a wave or down wind current? No matter our ability, that moment when wind and wave propel us forward we feel young and wild and free. After catching some solid waves we’re happier, friendlier and more relaxed. I live in Bend, Oregon so I think about surfing more than actually paddling for waves. When winter brings the ski-snowboard season and glides come from frozen waves – it’s all good. Fun, play, being active and the exhilarating feeling of wind in my hair – that’s the ticket! 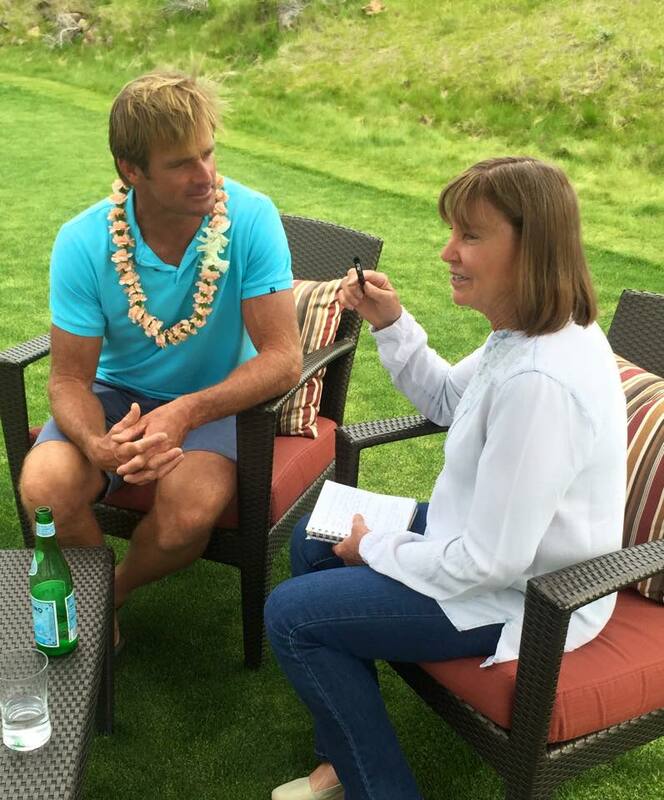 Laird Hamilton is a co-founder of GolfBoard, based in Sisters, OR. Laird laughed and said, ‘You’re only as old as you think or behave. Energy and a sense of play keep you young. I’d like you to meet my great friend and the inventive mind behind GolfBoard, Don Wildman.” With that Don came over to join the conversation. How lucky was I to share in a conversation with these two guys. Do NOT miss the chance to learn more about Don Wildman (perfect name for this guy) and his life and training philosophies. The following is an excerpt from the conversation I had with Laird before Don took over to teach me (in 1 minute) how to ride the GolfBoard. I loved the “woohoo” experience that just might have me dusting off the clubs and heading out for 9 holes of surfing the turf. ElderSUP: What is it about the way you experience sports that influences your unique ability to innovate, invent and collaborate? LH: I think innovation is in my DNA. I come from a long line of thinkers with a background in the sciences. I was a kid during the short board revolution in the 60’s so I was used to a lot of change around the sport of surfing. We lived at the end of a street where we didn’t watch much TV. We didn’t have a ton of toys so we all just went out to play, imagine, create – play was the key that fed my imagination. My Mom was a big factor in developing the way I think. She read to me a lot, great books like LORD OF THE RINGS and such. I love to create. In fact, I love the process more than the end result. If I build something that I think is cool and then i see someone else using it – with a big grin – there’s the reward and confirmation that what I build was good. ES: How tough do you think it will be for clubs immersed in the conventional and traditional way of playing golf to take a more hybrid approach. How will GolfBoard grow among golfers and their courses/clubs? LH: I know that you ski, and you have plenty of snowboarders at Mt. Bachelor. 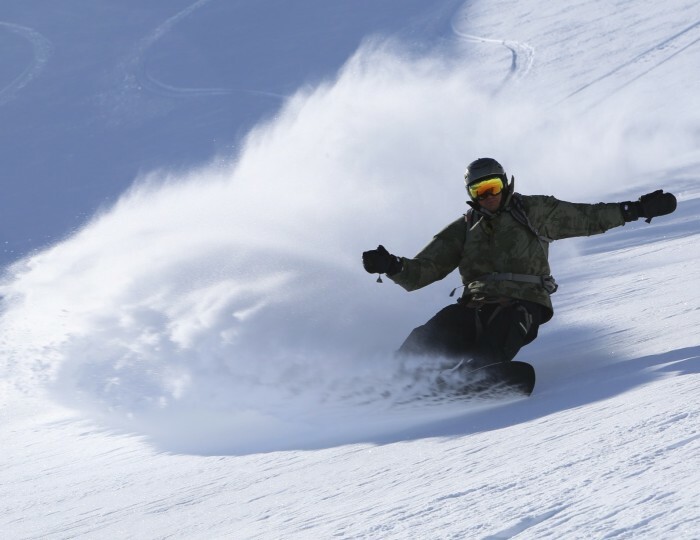 Ski engineering and design was revolutionized by snowboard design. On the other hand, snowboarding evolved as it did because snowboarders were able to use the infrastructure of lifts and grooming at a ski resort. Golf has a long history and a huge worldwide following, but clubs need to innovate and change in order to gain a broader membership, bring in younger players and engage golfers in new ways. By testing GolfBoard, Speed Golf and even Don’s version of Renegade Golf at the “early adopter” clubs like Tetherow we can use feedback – and watch for the smiles on the faces of golfers – in order to learn how to make the transition the best it can be. GolfBoard can impact the game of golf like snowboarding did for skiing. ES: What are some benefits golf clubs and golfers can expect to gain by adopting GolfBoard and new way of playing? ES: How hard is it to learn to ride the GolfBoard? LH: The learning curve is about as close to zero as it can be. Similar to standup paddling, once a person is on the board the actual riding or paddling is intuitive. We have had more than 1100 golfers riding the GolfBoard without a crash. We built the GolfBoard with specifications suited to preserve the conservancy of golf as a sport and the course. I appreciate the time with Laird, Don and the entire GolfBoard team. 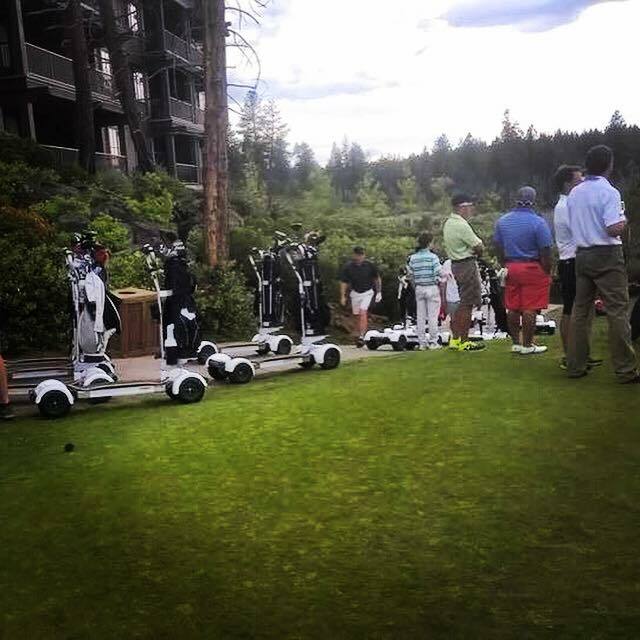 The inaugural GolfBoard tournament at Tetherow was stellar! You can FOLLOW GolfBoard on FACEBOOK. I have to stop writing now and go workout (not exactly how Laird goes about it) – and maybe grab Ed and head over to Aspen Lakes or Tetherow for some GolfBoard turf-surfing. Battle of the Paddle – GO! Dana Point will be bursting to the seams with every sort of standup paddler from the most elite to the curious newbie. From a huge array of vendors on the shore to the high-energy races and the exuberant fans, friends and families this is a not-to-be missed stand-up paddle (SUP) exposition that is an ocean festival celebrating what has become a global lifestyle. The expectation for more than 1000 entries is highly realistic – and I truly wish I could be entry number 1001. My guess? There are plenty of you out there who’d love to join in as well. There will be something for everyone. From beginners, to family and company relay teams, to high intensity elite competition, Battle of the Paddle is a showcase for the water sport we love. Long before I ever thought I’d have the skills to consider heading out for an event like Battle of the Paddle I received the 2009 Commemorative Promo DVD called, “Stand Up and Make a Difference” for the Battle of the Paddle. Seriously, the dream began. Just this summer we purchased a new Mike Waltze film called, “That First Glide.” The hook was now seriously set. The story began with images evoking the pioneers of 2000 years ago venturing from Tahiti on their paddle canoes. Over time, Hawaiians introduced surfing and paddling to the world. Over many generations, the “beach boys” refined their sport purely out of having fun on the waters that sustained and influenced their life and culture. No doubt you’ll be in awe of some of the waves the film captures, monsters being ridden with an evolutionary array of boards and paddles by modern day pioneers that include Gerry Lopez, Laird Hamilton, Dave Kalama, Chuck Patterson and many more. When you take the time to watch the film it’s hard not to get jazzed about riding waves and paddling flatwater that is accessible to any of us. The segment showing Laird and Dave simply playing on waves that many of us might find “not good enough” is a perfect example of the absolute versatility of standup paddling from the perspective of two of the greatest watermen. This is what it’s all about – Rainbow Sandals Founder Jay ‘Sparky’ Longley looks to the future of SUP – 12-year-old Riggs Napoleon, son of Aaron Napoleon. Photo by Chase Olivieri. Back to the theme of this article, the Battle of the Paddle. There is a short interview midway through the film in which Gerry Lopez is asked about the inspiration for what has become such an incredible SUP event. There is a pause and then a grin, Gerry explains that he and Sparky Longley (founder, Rainbow Sandals) both became enamored with standup at about the same time. When they started thinking about what kind of event they could design Gerry knew exactly what kind it should be. “The race should start right in the surf and go in and out through the surf with the course set right in the middle of the surf break.” And so began one of the most compelling and challenging ocean events drawing in some of the best ocean athletes in the world. The elite racers have to mix it up with a sprint through the gauntlet midway through their race. They return to the surf for another loop. Obviously these elite athletes have to stay tuned in to the condition and be in top physical shape. One aspect of BOP is that it includes events that stretch standup paddlers of all levels to the best of their current abilities. The Open course begins outside of the surf break. Demos and “fun” events allow beginners to feel a part of the energy and culture. To all of you reading this who are “BOP Dreaming,” take a look around your own backyard – or ocean, lake, river or bay. We are blessed with endless numbers and types of events organized by people with a similar passion for getting the SUP “game” right. Maybe you are one of those people. If so, please share a story or comment about your event. Just like we are collecting stories about SUP retailers and professionals working hard for a cause, we want to collect stories about people who infuse local events with a passion and energy similar to what the BOP has nurtured. Read a bit about one such event organizer, Steve Gates of Big Winds and the Naish Gorge Paddle Challenge in Hood River Oregon. Then send us e-mail with your story. We might not be part of the 1000+ at Battle of the Paddle in Dana Point next weekend, but we can be a part of the culture it inspires. Many sports have had their heroes – baseball’s Jackie Robinson and Roberto Clemente come to mind. From Arnold Palmer to Billie Jean King, sports greats often reach out to their community, to youth, and refine their sport to its highest levels. From the ancient heroes of standup paddle surfing, or in the Hawaiian language Hoe he’e nalu, to the modern pioneers Laird Hamilton and Dave Kalama who re-introduced the ancient sport of paddle surfing to the modern water sports world. Gerry Lopez is best known as Mr. Pipeline for pioneering one of the most challenging waves in the world with style. It was his experience and knowledge of waves and riding that allowed him to provide new SUP board shapes for these pioneers and many others. Those who have helped standup paddling and SUP surfing become the global phenomenon it is are certainly heroes for the sport. SUP paddling and surfing is a sport with dedicated professionals who travel almost constantly as ambassadors for the sport we love. Among them are Chuck Patterson and Karen Wrenn. I was fortunate to meet both of these great athletes – and all round generously warm and caring people – in Bend, OR. Not only did they give popular and well-liked clinics for both beginners and advanced paddlers, they participated in all the races. Yes, they grabbed their paddles and won the long course event (smiling and cheering on others all the way), but then they gathered at the short course, less competitive race, and built energy and zest into that race as well. 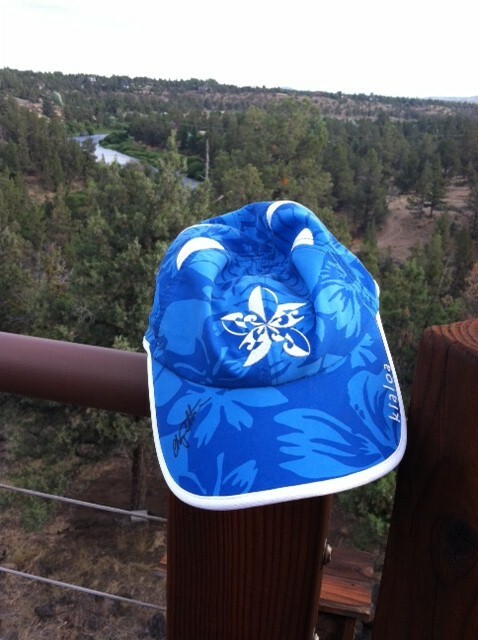 All racers got a great bag of schwag – and one of the cool new hats from Kialoa. I don’t usually do the “autograph” thing, but Chuck was so accessible and the spirit of the day was exactly what the sport of SUP is all about – at least in my mind. Even though the hat is getting salty and sun-bleached, I like the reminder from the autograph when I slip it over my ponytail and head out to the water. “Mana in humans is manifested as great skills, talents, strengths, intelligence and character. When using a KIALOA Paddle, that electric sensation one feels is the Mana. Keep Paddling,” is quote by Gerry Lopez on the Kialoa site. 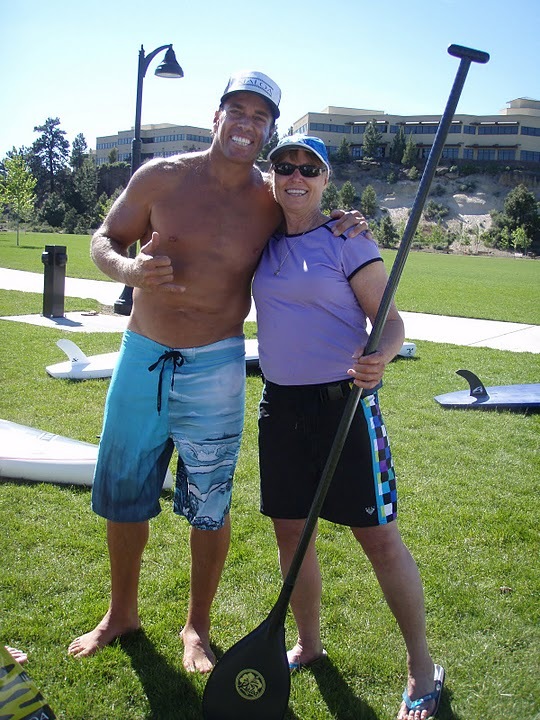 I know that when SUP greats like Chuck and Karen are present at an SUP event they expend almost as much energy sharing their mana as they do in paddling. Who’s the local hero for SUP in your community? Who personifies the characteristics that help the sport go from good to great in your locality? We look forward to hearing your stories and posting your photos – or linking to your blogs. You don’t have to be a pro to be the local hero. Your “autograph” on the experience of others builds out tradition and culture – share it.